Sunita says that before the women used to gossip about things. Now they don’t have time to gossip because they have more important things to discuss. They have learned to work together. Hatani says that now some of the women are starting to look at their daughters the same way they see their sons. Some have started to send their daughters to boarding school. 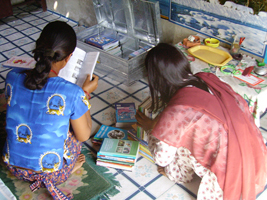 Manju says that the women can look after the books for their micro banks. They can do their own accounts. The support can't stop once the women have finished formal lessons. The more graduates emerging from classes, the more libraries are needed to satisfy the needs of not just the women, but the community as well. 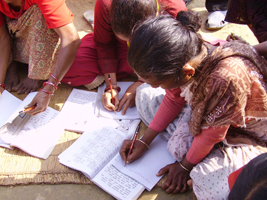 WELNepal has established 19 libraries for those women's groups that have completed literacy studies. Women who have come through our literacy programs want to put their skills and knowledge to good use, and we help them by providing post-literacy income generating programs. 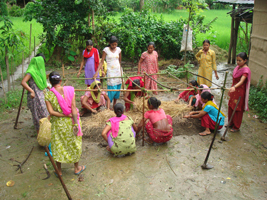 Our programs include organic farming training (including rental of land so the women can grow and sell their own produce), mushroom farming training, sewing machine training, soap and candle making training. Sadly, many families cannot afford to send their gifted daughters to post-secondary school. Even more unfortunately, many families still see education as something that's wasted on a woman or girl. Girls and women who do not stay in school are often married off — sometimes while they're still much too young — and may be treated as domestic servants in their marital home. 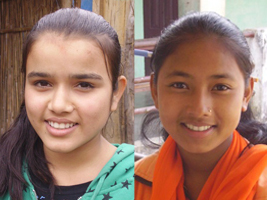 To break this cycle, WELNepal sponsors academically astute women and girls who wish to pursue a different path. Scholarship recipients: Ashmita Rimal and Samjana Mahato.